SetCronJob recently added a billing system which allows you to manage your billing addresses, payments and automatic payment profiles. To see all billing addresses, just visit Billing > Billing address. You can add new, edit, delete and make a billing address as primary address. Primary billing address will be populated into the payment forms e.g. 2Checkout's billing information form, so you won't need to enter it again (and also take advantage of 2Checkout Direct Checkout - popup with simplified checkout form). To see all payments made to SetCronJob, visit Billing > Payments tab. You can view a particular payment receipt by hitting the View button. On the receipt page, you'll be able to edit its attached billing address, or change to another billing address if necessary. At the payment receipt (hitting the View button), you can download the invoice for the service corresponding to that payment by hitting the Download PDF button. Please make sure that you have a billing address attached to that payment, and the billing information is correct. At the payments page, you can also request a full or partial refund of your latest payment. Each payment gateway has its own limit of refundable duration e.g. 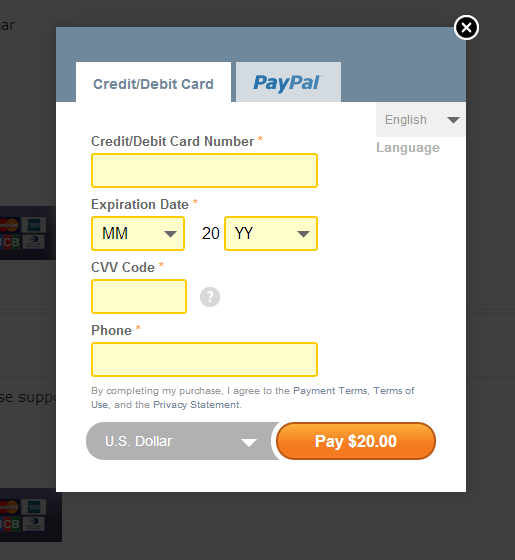 PayPal allows us to issue a refund for payment made within 60 days, while 2Checkout can issue a refund after 180 days. Within 3 days since payment date, you can request a full refund (100% amount) of your payment. After that we'll calculate remaining credit your current plan and account balance and show you the refundable amount (from $0.01 up to 100% amount). Request a refund of a recurring payment will also cancel its corresponding automatic payment profile. We'll process your refund request automatically using payment gateway's API. It takes a minute or two for your payment to be refunded. At the payments page, we also show the list of Automatic payment profiles (PayPal subscription, 2Checkout recurring payment). You can Cancel any profile if necessary, so it won't automatically charge you next year; but you'll need to create new one or renew your account manually. If you want to change your premium plan (Silver, Gold account), you'll need to cancel the automatic payment profile corresponding to it if any. If you already have an automatic payment profile e.g. a PayPal subscription, and you can't find it at your Billing > Payments page, please contact us, or search and manage it directly within your PayPal account. Have any question or suggestion? Please comment below or contact me! UPDATED on Oct 7, 2013: We also stored a copy of export files remotely on tny.cz where you can download it later from your Export History. 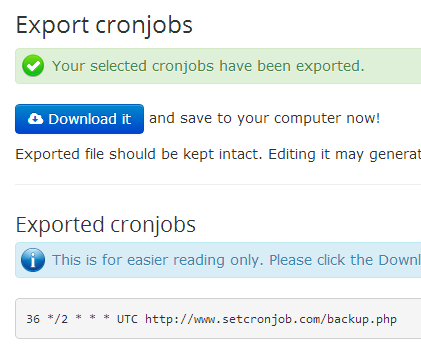 We've just added a new feature: You can now export your cronjobs at SetCronJob, then import at any time you want! To export all cronjobs and groups under your account, visit Cron Jobs > Export, then hit Export all cronjobs button. At the next page, click Donwnload it button, it'll prompt a file to save on your computer. For your convenience, we also display a nice format of exported cronjobs (Unix-style time settings, timezone and URL). 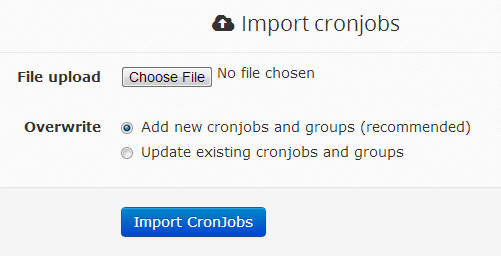 To export only some cronjobs in your account, select desired cronjobs, then hit With selected: Export cronjobs. It'll show you the page where you can download your exported file. Currently we only support importing file which was exported by SetCronJob. 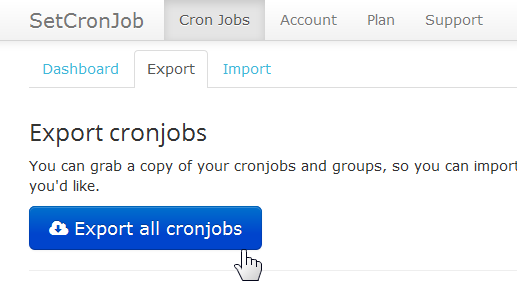 To import old cronjobs, visit Cron Jobs > Import, then upload the file you saved before. This will add completely new cronjobs and group, and will keep your existing cronjobs intact. After importing, you'd better review and remove/disable redundant cronjobs/groups. If the cronjob/group with same ID exist, SetCronJob will update it. This may make your current cronjobs and groups setting lost. All export files are also stored remotely on tny.cz. 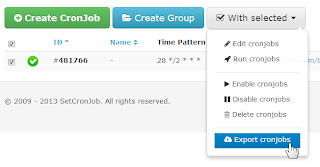 You can visit CronJobs > Export > Export History and download desired export file. If there's anything you'd like to improve, feel free to contact us or leave a comment below.